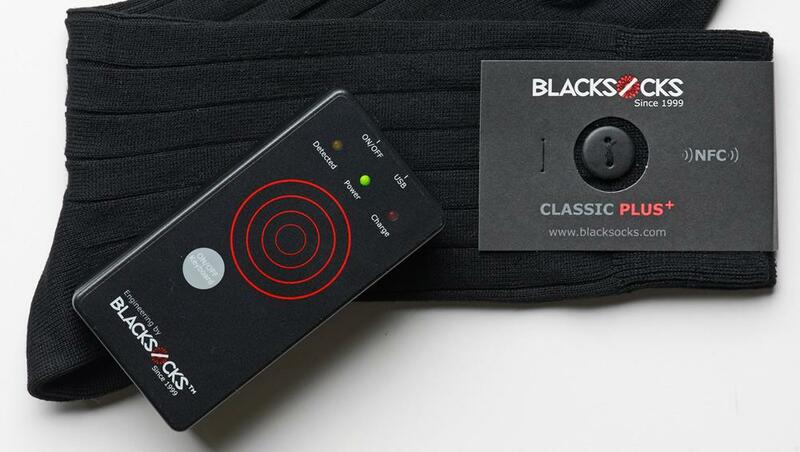 Detailed on the Blacksocks site, the clothing company has added a radio ID tag to a line of socks that allows consumers to keep track of the footwear within the bedroom or when being washed. The Swiss company attached the tag at the top of the socks and it can be scanned with the included RFID reader. Shaped like a small garage door remote control, the RFID reader communicates with an iPhone over Bluetooth in order to transmit specific information about the sock. Within the Blacksocks application, the user will be able to match up the same two socks over and over in addition to tracking data like the amount of times that the sock has been washed or the original production date of each individual sock. However, anyone can download the iPhone application in order to use the camera tool to measure the black level of their current socks. Using the iPhone camera, the application measures the black level on the image and offers a recommendation regarding the purchase of newer socks. The camera also takes a light reading on a white surface in order to calibrate the application for the room’s lighting. Regarding keeping track of socks with the application, the app allows the user to pair socks together. If a sock is destroyed or fades after repeated washing, it can be paired with another tagged sock using the app. Called the Plus+ socks, the radio ID tag looks like a small button on the outside of each sock. The socks are mostly made out of Peruvian pima cotton and basically look like a standard dress sock. However, the socks are definitely on the expensive side. 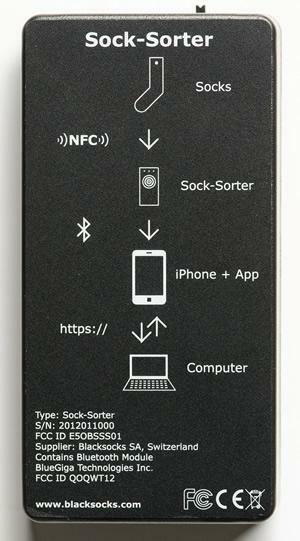 Blacksocks sells 10 pairs of RFID-tagged socks in three different sizes along with the RFID reader for a steep price of $189. In addition, replacement Plus+ socks can be purchased in 10-pair allotments without the RFID reader for $120.